Biomaterials is a field that continues to attract a significant amount of attention from researchers, industry, educationalists and regulators. This book is the first to provide readers with an understanding of fundamental theory relating to the use of metals in biomedical applications in addition to comprehensively covering applied aspects encompassing practical and technical advantages and disadvantages. Topics highlighted in the book include guidelines for selecting materials; shape memory alloys; degradation and surface modification; adhesion to ceramics and polymers; biocompartibility and tissue-implant interactions; and European and North American regulatory issues. 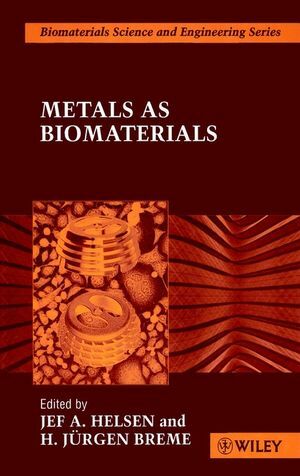 Jef A. Helsen and H. Jürgen Breme are the authors of Metals as Biomaterials, published by Wiley. Selection of Materials (H. Breme & J. Helsen). Metals and Implants (H. Breme, et al.). Shape Memory Alloys (J. Humbeeck, et al.). Degradation (in vitro-in vivo Corrosion) (D. Scharnweber). Surfaces, Surface Modification and Tailoring (H. Breme). Special Thin Organic Coatings (H. Worch). Adhesion of Polymers (W. Possart). Adhesion to Ceramics (H. Breme, et al.). Biological Response and Biocompatibility (H. Hildebrand & J.-C. Hornez). Cells and Metals (D. Jones). X-Ray Photoelectron Spectroscopy (J. Pireaux & J. Riga). Atomic Force Microscopy (U. Hartmann). Electrochemical Impedance Spectroscopy as a Surface Analytical Technique for Biomaterials (J. Hubrecht). Retrieval Analysis (P. Laffargue, et al. ).